#1 Caution wet floors. 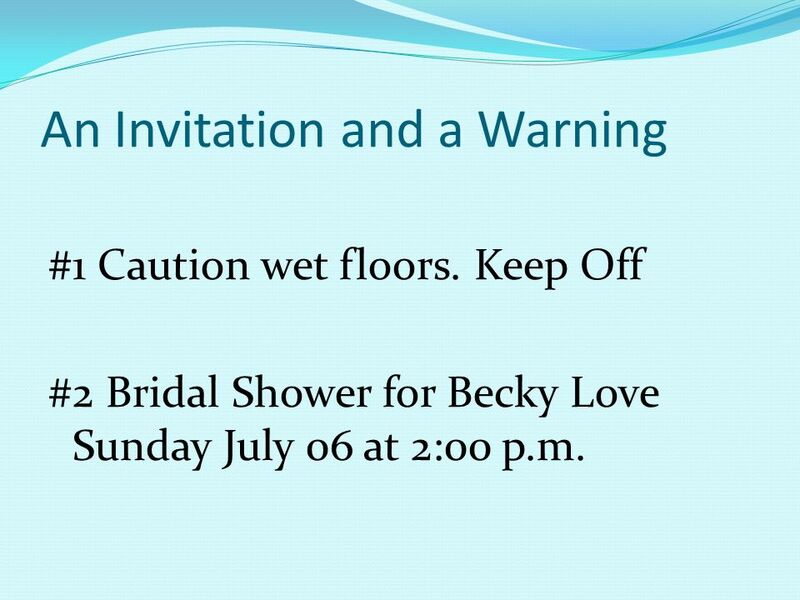 Keep Off #2 Bridal Shower for Becky Love Sunday July 06 at 2:00 p.m.
Scripture Reading Revelation 21:6-8 (NIV) 6 … I am the Alpha and the Omega, the Beginning and the End. To him who is thirsty I will give to drink without cost from the spring of the water of life. 7 He who overcomes will inherit all this, and I will be his God and he will be my son. 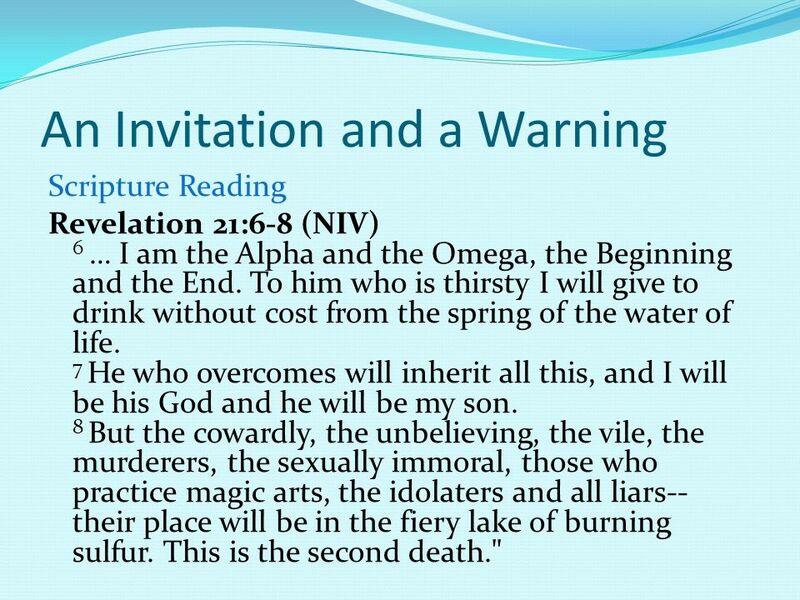 8 But the cowardly, the unbelieving, the vile, the murderers, the sexually immoral, those who practice magic arts, the idolaters and all liars--their place will be in the fiery lake of burning sulfur. This is the second death." # 1. Man’s warnings usually have immediate consequences whereas god’s warnings might have consequences that reach way out into the future. 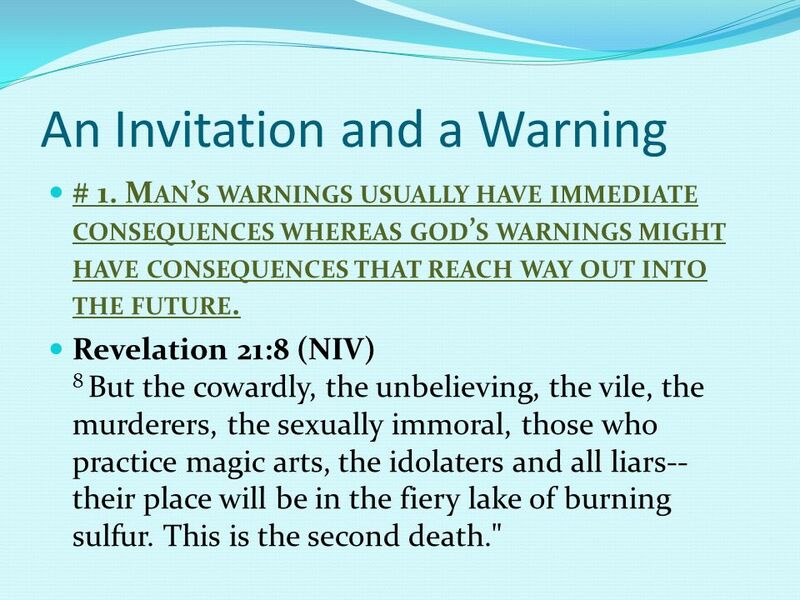 Revelation 21:8 (NIV) 8 But the cowardly, the unbelieving, the vile, the murderers, the sexually immoral, those who practice magic arts, the idolaters and all liars--their place will be in the fiery lake of burning sulfur. This is the second death." #2. 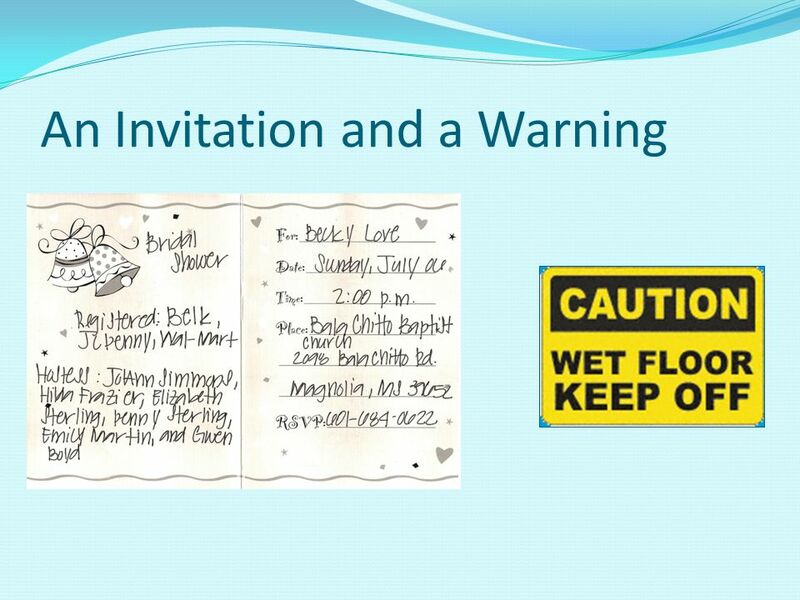 Man’s invitations usually come with conditions and we are comfortable with that; God invitations come with no conditions and we are uncomfortable with that. 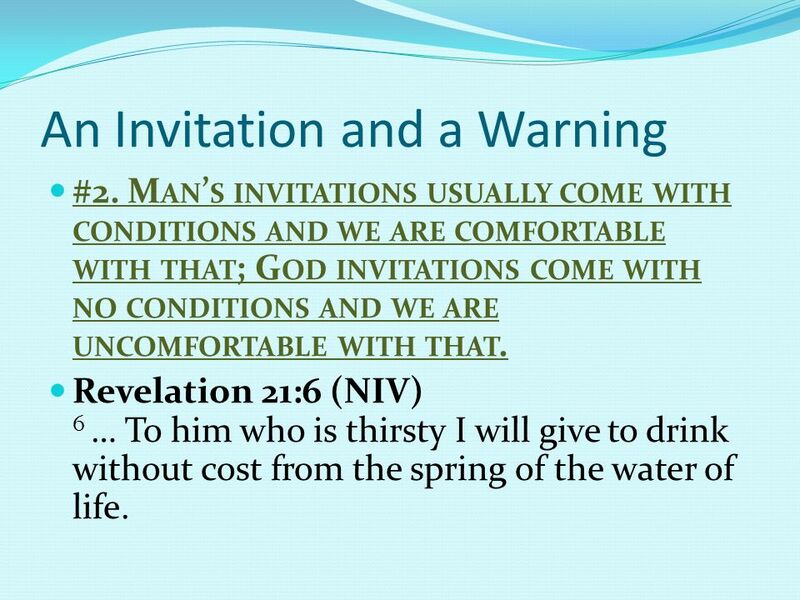 Revelation 21:6 (NIV) 6 … To him who is thirsty I will give to drink without cost from the spring of the water of life. #3. God chose to describe Himself as the Alpha and Omega to reveal to us two very distinct Attributes of Himself. 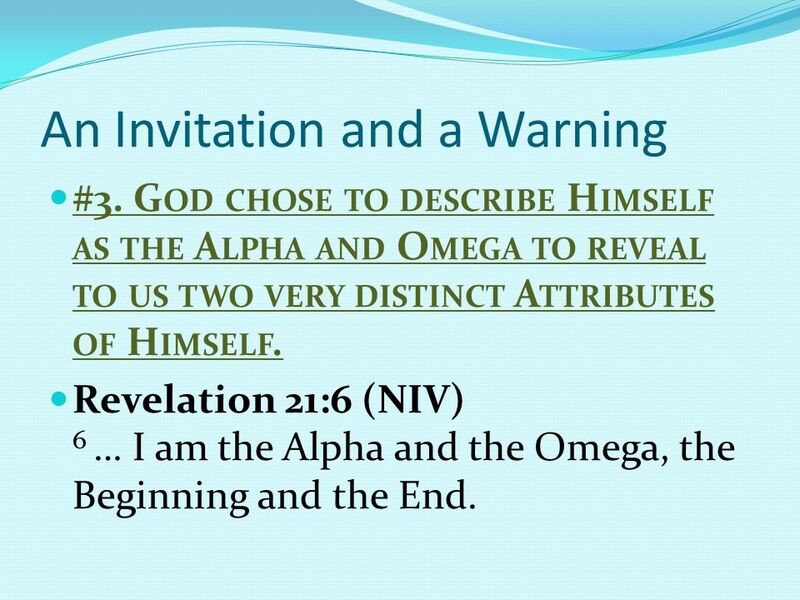 Revelation 21:6 (NIV) 6 … I am the Alpha and the Omega, the Beginning and the End. You may say that I don’t know what God is doing in my life. I can tell you one of two things that is doing in your life. 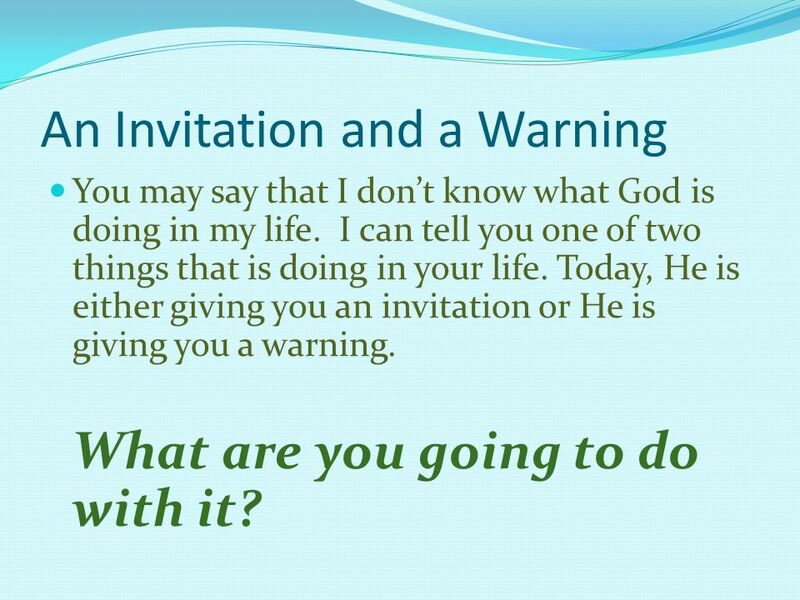 Today, He is either giving you an invitation or He is giving you a warning. What are you going to do with it? 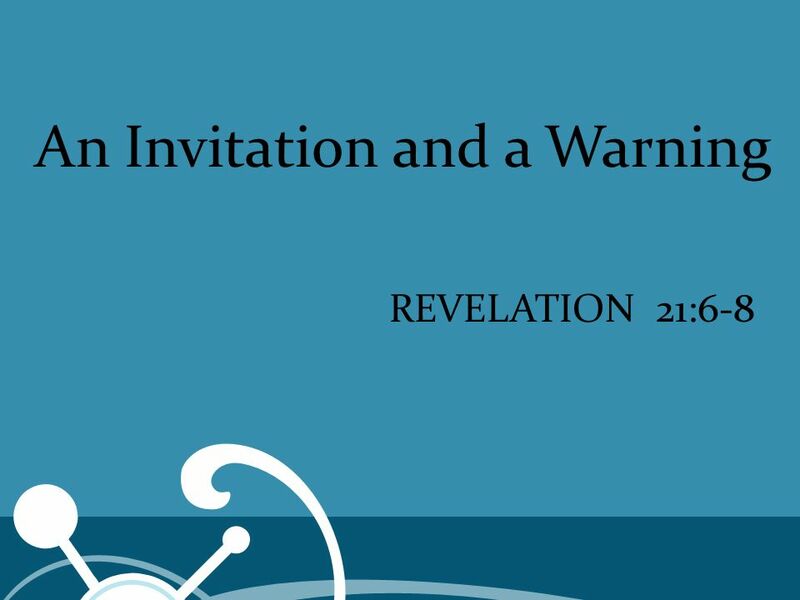 Download ppt "An Invitation and a Warning"
John 14:2-3 In my Father's house are many rooms; if it were not so, I would have told you. I am going there to prepare a place for you. And if I go and. GOD’S WAY TO HEAVEN Can we ask you a couple of questions? To Tell the Truth The Jesus Curriculum Th e The Sermon on the Mount Matthew 5-7 Kingdom Handbook. The Afterlife June 5, 2011 Heaven: What is it like and who gets in? Revelation Then I saw a new heaven and a new earth, for the first heaven and the first earth had passed away, and there was no longer any sea. Suffering. Psalms 22:24 (MSG) He has never let you down, never looked the other way when you were being kicked around. He has never wandered off to. ICEL Revelation 21:1-7 1 Then I saw a new heaven and a new earth, for the first heaven and the first earth had passed away, and there was no longer any. The Covenant: A Kingdom Tale. Luke He said to them, “How foolish you are, and how slow to believe all that the prophets have spoken! 26 Did not. Today’s Scripture Reading James 1:12. Real Christians Are Persevering James 1:12. A Following Our Lord Jesus Christ by Pastor Fee Soliven Luke 9:57-62 Sunday Morning December 21, 2014. The New Jerusalem Messages from Patmos for Today! Revelation Seminars 24. The New Jerusalem Revelation 21:1-4 - Then I saw a new heaven and a new earth, for the first heaven and the first earth had passed away, and there was. VICTORY CENTRE SWINDON SUNDAY SCHOOL 14 APR 13 VICTORY CENTRE SWINDON SUNDAY SCHOOL 14 APR 13.